Rest is an absolute necessity. Sleep helps to prepare our bodies and minds so that we can actually live life as children of the light. 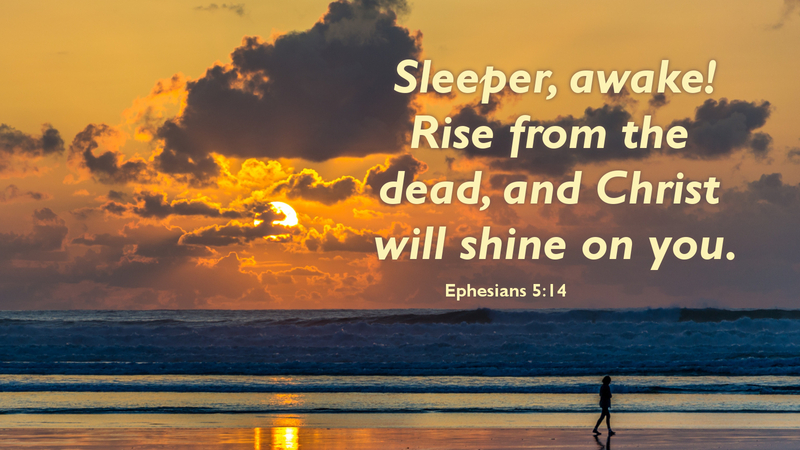 We need sleep so that we are able to walk in the light, following in the footsteps of Jesus, so that God might be glorified in all that we say and think and do. But, Paul speaks of another kind of sleep and of darkness. It is that kind of darkness where our days and nights are wasted in things not profitable to the Kingdom, but are instead used to satisfy our own desires and build up little fiefdoms of our own. We are to be spending our energies on this kingdom. We are to walk in the light of Christ in his Kingdom. We are to follow wherever he would lead us, whether it is through the Jordan, to assist a neighbor or stranger in need, or to sing hymns and praise God as a community of saints. We walk and live in the light, doing what is pleasing to God in order to glorify God. May the light of Christ shine on us so that our eyes may be opened to see where he would lead us. Prayer: Wake me up, Lord, to follow you into the light of your Kingdom. Amen.